This instant access icon serves as the bridge between your work devices and eFileCabinet DMS, eliminating the need to toggle back and forth between programs. It also provides rapid file uploading, letting you upload up to 50+ files at a time. This automates a process you likely partake in every day, which will free up a lot of extra time to do what matters for your business. The SideKick is dynamic, really fast, and synchronizes immediately. Quite simply, this will change the way you work for the better. This incredible document management superpower is the easiest way to interact with and maintain your files and allows you to work with commonly used documents without even having to log in. It’s dynamic, really fast, and synchronizes immediately. We believe it will change the way you use document management. Compatible with all popular internet browsers—no plug-ins needed. Very simple versioning, all in one place with just one click. Edit document names and profile information: a valuable tool when printing and scanning documents. Popular ‘hover over’ editing, or ‘mouse-over’ functionality, with easy-to-recognize icon interfaces. Pin it! This utility allows for complete drag and drop. 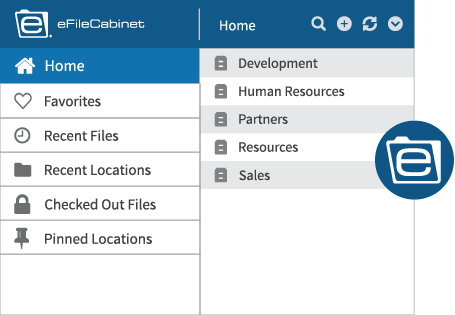 Bringing files into eFC has never been this easy! Fast drag and drop with interactive mode, letting you queue up files to upload with ease. Dynamic panels and responsive design allows you to size panels according to screen size. Comments for each document can be seen at a glance in full conversation view. Incredible visibility and context with a comprehensive file previewer; easily see where you are as you work in your files. Quick Search with advanced and basic capabilities. Instantly save searches, filter, and sort. New Quick Access Menu, including Recents, Favorites, Tagged, and Checked Out items. Uploads Dialog Box—shows queue and incomplete uploads in real time and in the same view. It will change the way you work, and leave everyone wondering where you got your superpowers.